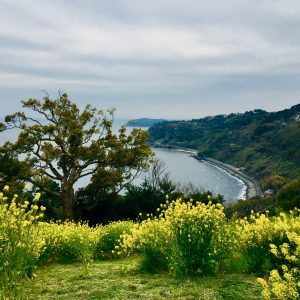 Tokyoites in need of a break from the hustle and bustle of city life usually head to the hot springs and scenic comforts of Hakone or Izu, which are within easy reach of the megalopolis by car or train. 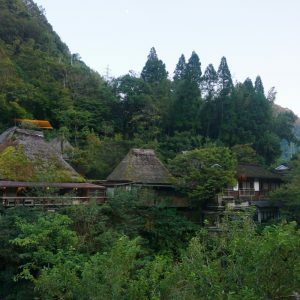 But relatively few of them may know that there is an onsen, or hot spring town, which is even closer to Tokyo than either of the city’s best-known getaway sanctuaries. Tsurumaki Onsen is a small town in Kanagawa prefecture, which has attracted visitors to its calcium-rich hot springs since the Meiji era (1868-1912). 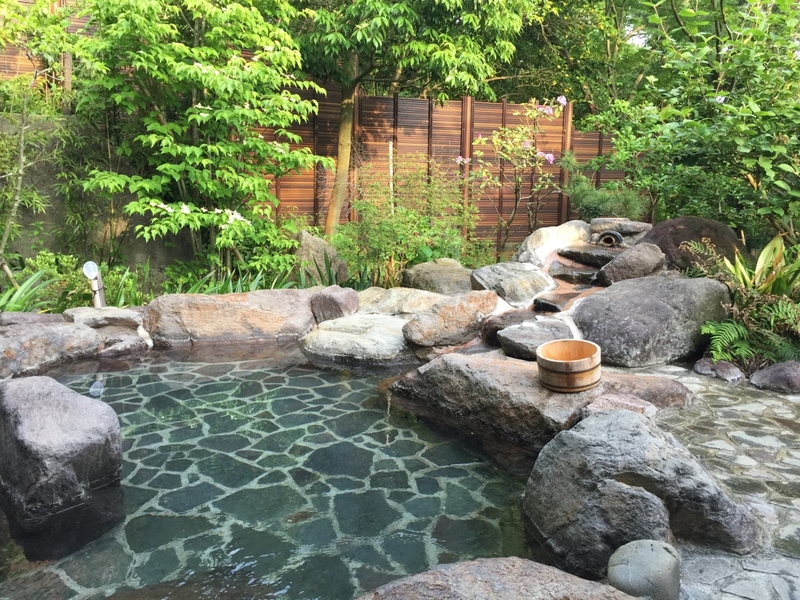 Sadly, the town, which is just an hour south from Shinjuku station in central Tokyo, has lost any charm it may have had as a traditional hot spring resort and has become a typically drab suburb of nearby cities to which residents commute for work, such as Atsugi and even Tokyo. 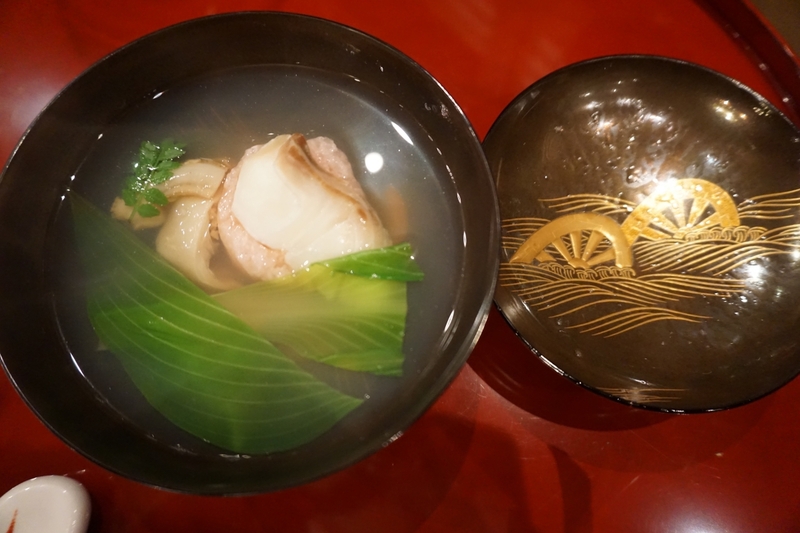 Fortunately, one Tsurumaki ryokan, or traditional Japanese inn, has managed to buck the suburbanization trend and has preserved its historic roots and natural beauty – Jinya. 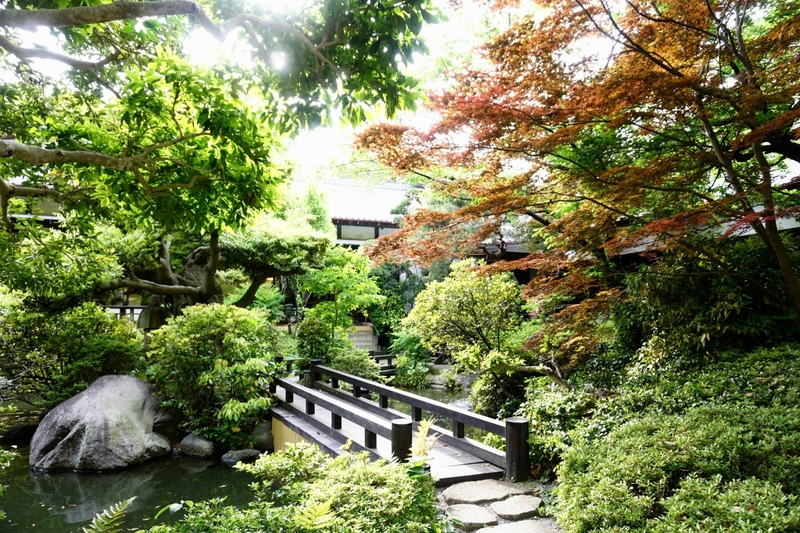 Located just a few minutes’ walk from Tsurumaki Onsen station, Jinya, with its historic buildings and lush gardens spanning 8.2 acres, is a world unto itself. 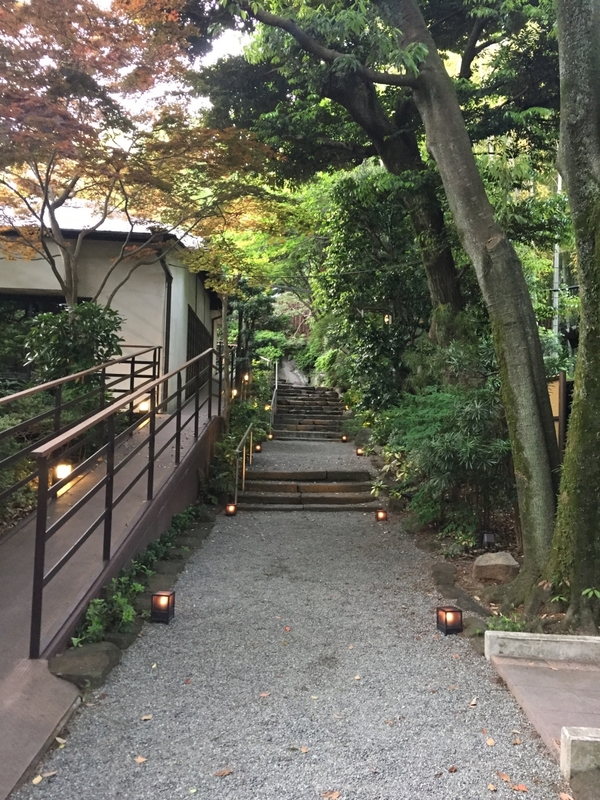 The feeling of being transported back in time begins as soon as you spot the entrance to Jinya, where a friendly gatekeeper dressed in traditional attire welcomes guests and offers to carry their bags. The friendly monban, or guard, greets guests at the entrance. Take one step inside the garden and it’s easy to imagine yourself wandering the grounds of a wealthy aristocrat’s mansion deep in the countryside. Lush trees, including maple and pine, provide shelter from the sun. 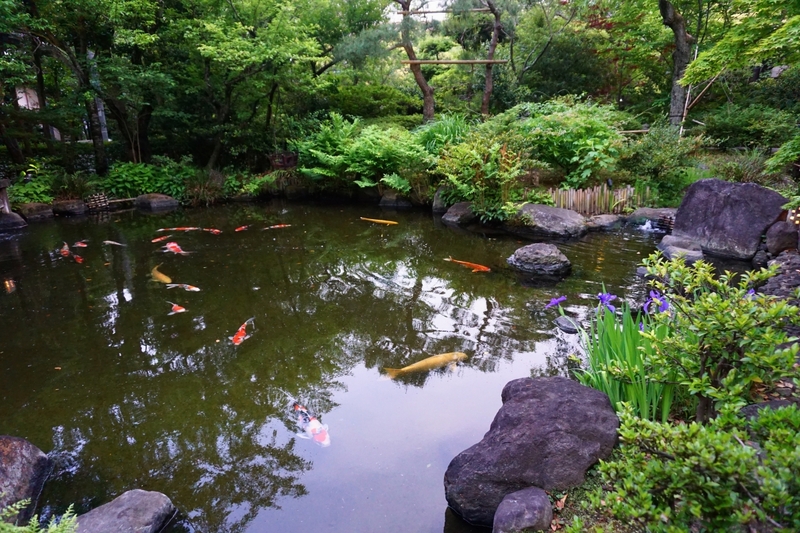 One of the ponds in the garden featuring carp and a fountain. 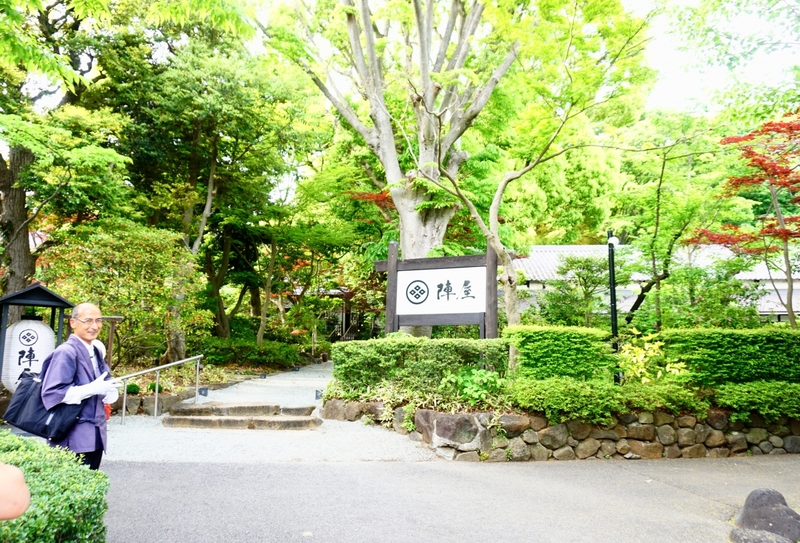 One of several buildings on the grounds of Jinya available for special events. Be sure to take a good look at the huge kusunoki, or camphor tree, a few steps in, on your right, which soars majestically to the sky. 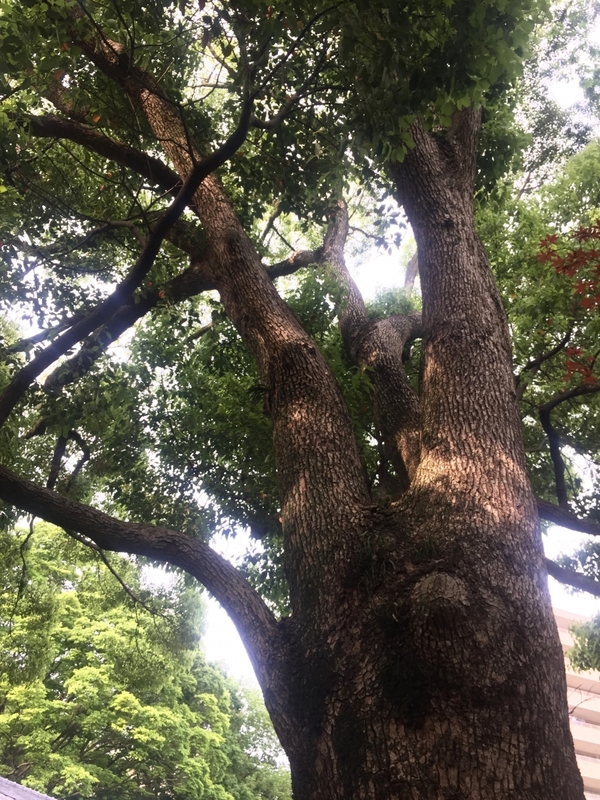 This is no ordinary camphor tree, but the very model for the tree where Totoro, the imaginary creature in the Hayao Miyazaki animated film, ‘My Neigbor Totoro’, lives. Hayao Miyazaki, director of the animated film, ‘My Neighbor Totoro’, used to climb this tree as a child. Indeed, Jinya’s garden may have provided Miyazaki with much of his imagery for the film. As a child, Miyazaki frequently visited Jinya, which is owned and managed by his cousin, and the story goes that he loved to climb that magnificent camphor tree. The original building where Jinya opened for business more than 100 years ago, used to be the guesthouse of the Kuroda clan in Oiso, a beachside town, where Kuroda, a feudal lord, hosted the emperor. The building, which was brought from the seaside town of Oiso to its current location, has been renovated and extended over the years, making for an intriguing amalgamation. A view of the dining room at Jinya. On display throughout the main building are numerous artifacts, such as a sword used by Musashi Miyamoto (1584-1645), an expert swordsman and ronin, a samurai without a master, who is said to have won 60 consecutive duels. Jinya is also the site of many of the most famous tournaments of shogi and go – the complex Japanese board games – hosting more than 300 shogi and go championships over the decades. 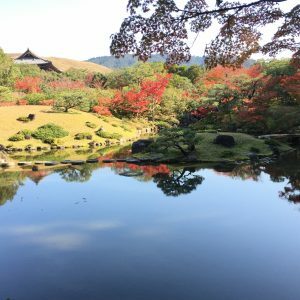 Given that there is nothing much to do in the town of Tsurumaki Onsen itself, it is fortunate that Jinya has such an interesting display of historic artifacts and photos as well as an immaculate garden, which is definitely worth taking the time to explore. 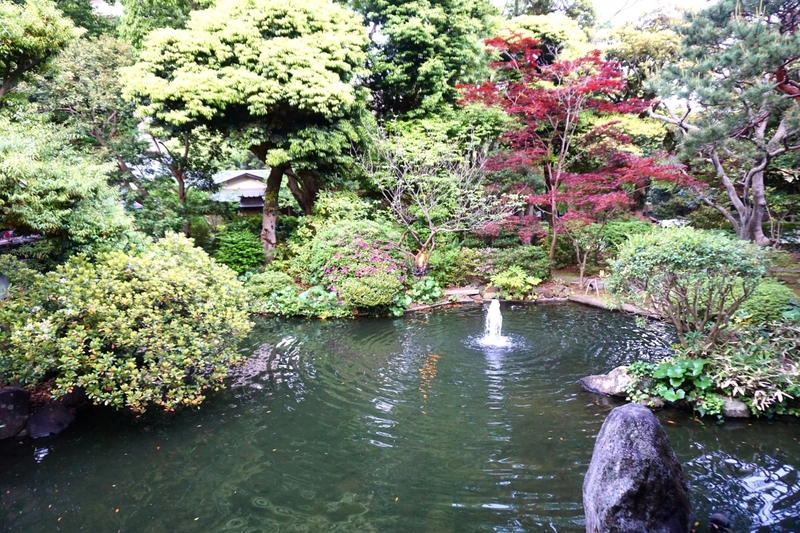 A pond near the breakfast room at Jinya. At the back of the garden is a small shrine to the god of farming and grains, known as inari jinjya, complete with the bright red torii gates that are a feature of many Japanese shrines. 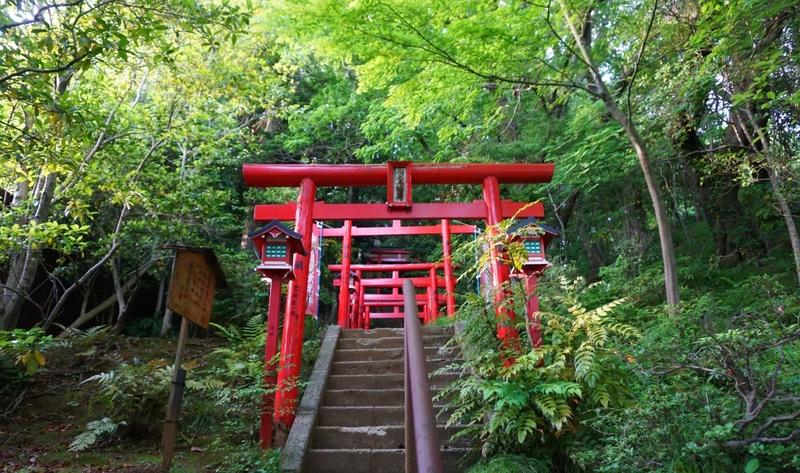 The red torii gates leading to the shrine provide a striking contrast to the surrounding greenery. We stayed in a huge Japanese-style suite with a hinoki (Japanese cypress) rotenburo, or outside bath, and views of the verdant greenery. 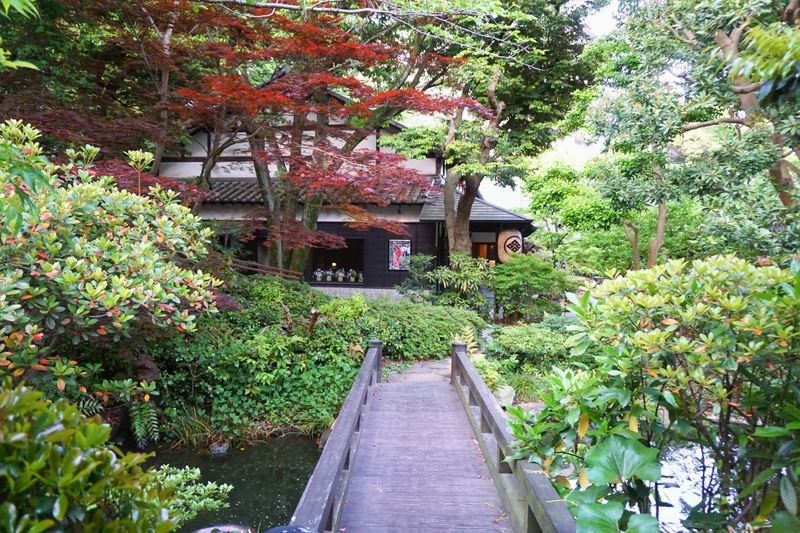 The communal rotenburo is made of rocks rather than hinoki. 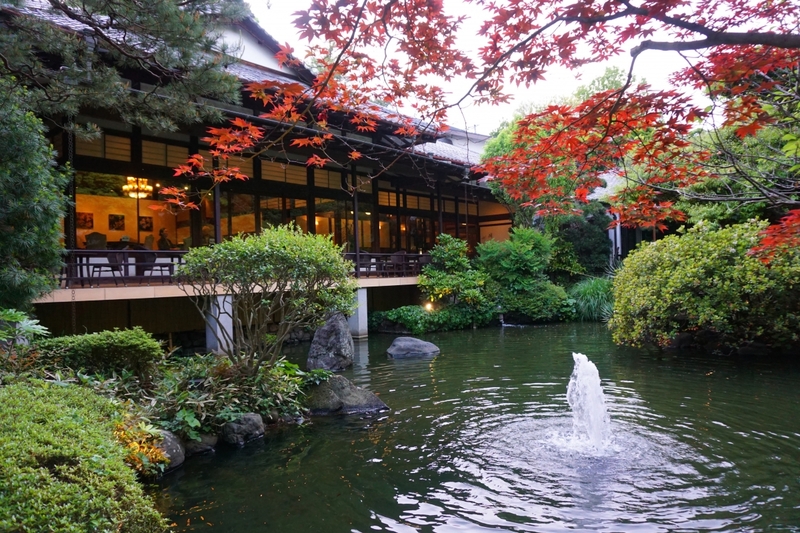 Jinya is a conveniently located hot spring inn where guests can relax, soak in the mineral-rich water, walk in the lush garden and enjoy high quality Japanese kaiseki cuisine. 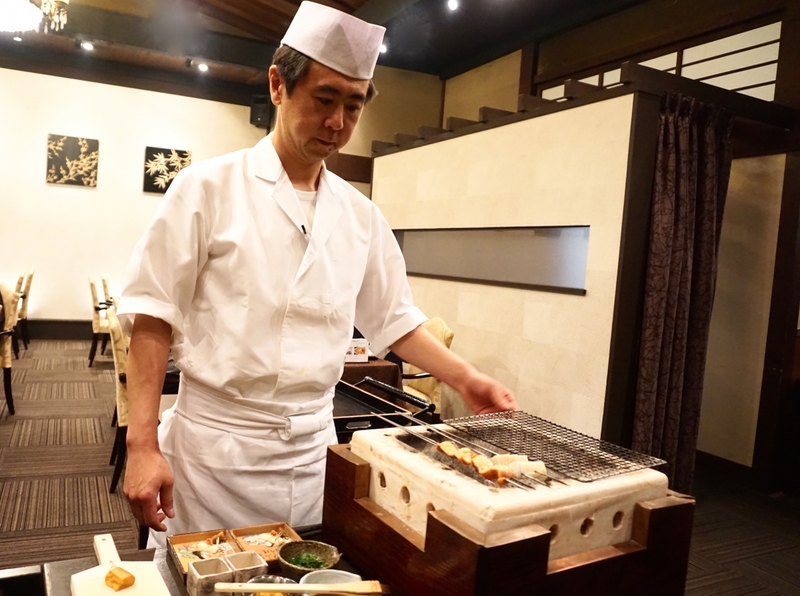 The chef will come and grill fish and vegetables at your table. The soup course was full of flavor and very filling. For day visitors, it is also possible to just stop by for a sumptuous meal, a dip in the hot spring bath and a leisurely stroll in the garden. At dusk, lanterns are lit to guide visitors along the paths in the garden.